Home » Why Aren't You Reading...? » Why Aren’t You Reading Kim Stanley Robinson’s Red Mars? Why Aren’t You Reading Kim Stanley Robinson’s Red Mars? 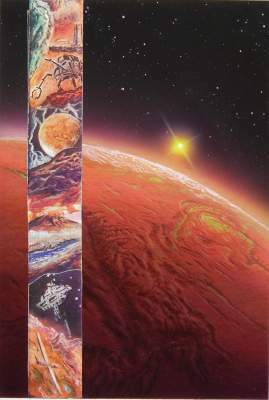 No other book has affected my life as much as Kim Stanley Robinson’s meticulously detailed science opera, Red Mars. If you want to walk side by side across the surface of an alien planet, with characters whose flaws and humanity, their neuroses and genius make you feel like you are standing right there, then take a trip aboard the Ares into a epic, century’s long story of the taming of Mars. The book’s prologue introduces us to our characters, decades after the first colonists have landed, a time of celebration for the ribbon cutting of the first free standing city on Mars. You are immediately put into the mind of one of the main characters, and with each act of the book you will be shown the changing face of Mars through a different person’s eyes, a unique prospective. In the first ten minutes you are exposed to horrific tragedy, the death of friend, immersing yourself in the thick of a complex and life-like world, full of political intrigue and interpersonal relationships. There is no need to feel overwhelmed, though, as the author intends to show you how it all began. In the first full chapter, time rewinds back to the launch of the ‘First Hundred’, a multinational group of colonists who have been selected to set up base camp on the red planet. Here Kim has really done his research, from the descriptions of the psychological profiling process the participants go through, to the excited inventorying of the tools the colonists will use for building a new world. Each character’s specialty, from geology to therapy, physics to agriculture, widens the concept of this book, and shows us that when an entire planet’s worth of knowledge is distilled into just one hundred individuals, worlds can be conquered. You will see glimpses of the other stories going on in the background, stories like whispers or rumors among the colonists. Then suddenly, another character will take the stage, showing a different side of the burgeoning community, and those rumors will blossom into their own. As counties start sending more people to Mars, the small time politics of a tiny outpost breaks out into global factions, the intrigue of mysterious disappearing colonists, and the enigmatic maneuvering of multinational corporations. The story scales up at a exciting pace, as a small scientific effort spawns the possibility, or maybe inevitability, of interplanetary conflict. Finally, while Kim understands human character growth, he also understands one of the most interesting characters is Mars itself. We get a window into a whole new culture, trying to be free and distinct from is parent earth, while knowing it will never quite escape the baggage of thousands of years of human history and nature. You will care for this cast of characters, their causes and their passions, the tragedies and triumphs. In the end, reading this book will make you itch for the frontier, the unclaimed wild land of the red planet. It will make you want to reach for that small red light in the sky, and I think that is the most beautiful result of this great novel. You can pick up a copy of Red Mars on Amazon for as low as 1 cent used! Most bookstores keep a copy of the trilogy, and for the first ten people, if you contact me I will be thrilled to send you a free copy of my favorite book. By Teagan Gilbert in Why Aren't You Reading...? on July 27, 2013 . …because I have already? 😉 But yes, one of the best books on future colonization. I thought the sequels become progressively less interesting as the technology increased. I would agree, that it’s not the traditional space opera formula. The interpersonal relationships and how they evolve over centuries were epic in scope, though, and I felt deserved the moniker. In a sense, space opera is about melodrama, and that’s a component of the Mars Trilogy, but kind of in a self-aware way. It’s a hard science, struggling-towards-utopia family saga, where the family is all of humanity, but mainly the First Hundred. Made a few small changes, cleaned up some language and punctuation. Because it is boring. Tossed it out mid-book. Hello, i’ll take your word, i’d Love to have a copy of Red Mars..! Sounds like a winner, well worth reading and being inspired.. i occasionally feel that i belong on Mars and not stuck here among all these humans, silly and mostly unevolved creatures.. If i could make it home to Mars i would do the logical thing, open a Mars Bar and Barbeque for all the newcome settlers, no charge of course..! Contact me at Todd@tjgilbert.com, let me know paperback or kindle. If paperback I’ll need an address. Happy reading! i may not make it to First Men on Mars, which would be disappointing, suitcase packed and everything, but hypothetical spirit could proceed them and activate available molecular clusters preparatory to arrival of alien Earth lifeforms fixing to infest the whole of planet Mars.. Fight to the Death, spare them no quarter, red human blood on red Martian soil..! Chew them up, spit them out..! Invade Earth, water for Mars..! Genetically alter human configuration, make them meatier, tastier, more agreeable to look at, less fat, lean and mean, a better pet you couldn’t ask for.. Prepare for invasion, then turn the tables, welcome the unsuspecting, smile with whole body while manipulate alien minds and consciousness to happy outcome for us, bloody red Martian peaceforce..!